Winter is over….and I am so happy to welcome spring. I wanted to start decorating, I decided to make a Spring Wreath! I had purchased the white basket….filled with hydrangeas. I found it at a garage sale for $2. Those flowers are so expensive to purchase at a craft store.This was a great find. I started pulling them apart. I used the greenery all around the twig wreath I was going to use. Lots and lots of great stuff I can use on the wreath. I had this neat little bunny I had from a few years ago….pushing her little one in a cart! I just love how cute they look….I used thin floral wire to hold it on. I attached it to the bottom right side of the wreath.I added some more greenery I had from a grape vine. Aren’t they adorable. Then a idea struck!!! I looked around for something round. I found a empty ‘painters tape’ roll…perfect. Then I grabbed up some lavender grass. I made a nest! I put in some pretty eggs! I attached the nest to the wreath. 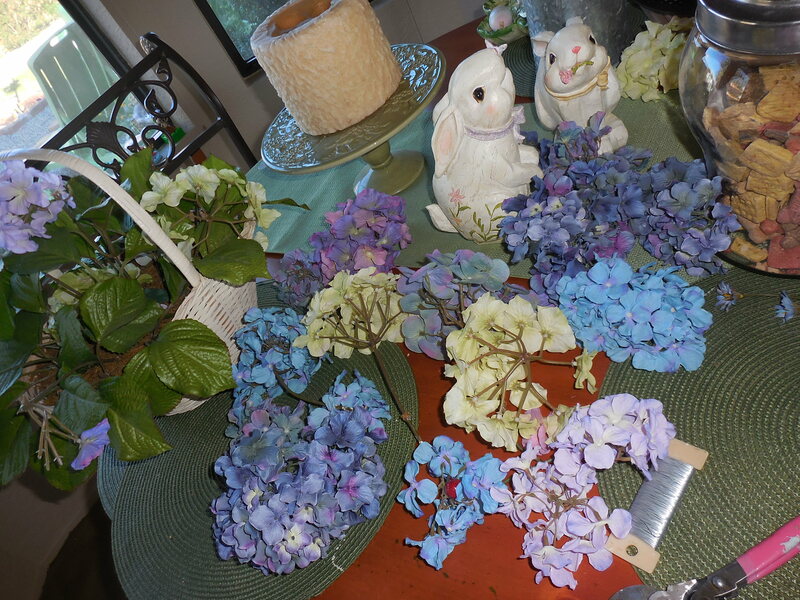 I then started adding the hydrangeas, butterfly and hid eggs among the greenery! This is what it looks like on my door! You can buy these vine wreaths at Walmart. You can add anything you already have to the wreath. Just use thin floral wire to attach. I hope you like this and it inspires you to create a Spring Wreath for your front door! Such pretty colors! I love what you’ve done…well, I guess I always love what you do! Great work! You are so sweet Deb! Thank you so much!